900 South Trenton Avenue (Trenton) is located just 3/4 mile from the Parkway East (Route 376) at the Edgewood/Swissvale Exit (Number 77 in Regent Square. Trenton is situated 3 blocks off Braddock Avenue (please see map below). 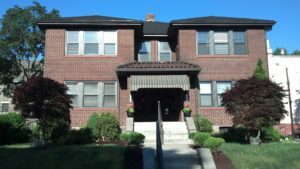 Trenton is an eclectic two story brick building constructed around 1925 which houses four 1-bedroom apartments and four garages situated on a nicely landscaped corner lot. The Apartments are serviced by individual gas hot water heat. Most apartments have been renovated to include new appliances, refinished hardwood floors, ceiling fans, mini-blinds and paint. All have decorative tile fireplaces, sun rooms, large walk in closets, built in china closets, separate entrances and side porches off the kitchens. There is a coin-op laundry along with storage lockers in the basement. There is plenty of on-street parking and bus service is available near the door. Garage space may be available. The area known by local residents as Regent Square is located in the Borough of Wilkinsburg which, according to the most recent census, has a population of approximately 928. Regent Square is located approximately 5 miles east of the City of Pittsburgh and 14 miles east of Pittsburgh International Airport off the Parkway East (Route 376 East) at exit 9. The major access road through Regent Square is South Braddock Avenue. Laurel Properties 900/902 South Trenton Avenue property is located just 1/2 mile off of the Parkway East and three blocks off South Braddock by making a right turn on Henrietta Street (which becomes Mifflin) to the corner of Trenton and Mifflin. Regent Square features a small eclectic shopping area on South Braddock Avenue as well as access to Frick Park. Additional shopping is available in the Edgewood Town Square Shopping Center across the Parkway East in Swissvale or in Monroeville approximately 6 miles further east on the Parkway East. Located there are numerous restaurants, stores, shopping centers, theaters and the noted Monroeville Mall. Regent Square is served by the Wilkinsburg full time paid police force, a full time paid fire department and a full time paid ambulance service. Nearby hospitals include West Penn Hospital in Bloomfield and The University of Pittsburgh Medical center which is only 4 miles away. Residents of Regent Square attend the Wilkinsburg School District.